It’s basically 2017, but that mean New Year’s Eve is TOMORROW and we couldn’t be more excited to ring in the new year with open arms. We’re sure your plans are full of bubbly and poppers but we wanted to give you a last minute craft idea to make tomorrow festive, fun and over the top. We bring you: DIY masks! Whether it’s for a masquerade or you just want to be the coolest one at Congress – here’s a simple way to make New years Eve a blast. You can make your mask from things you probably already have around the house with only a few items easily purchased at your local dollar store. Not only will you save money putting your New Year’s Eve mask together but you can turn this into family fun time for the little ones not going out to celebrate. You’ll all have a great time as you look back on the memories of 2016 and get ready to be part of a new year and a new you! *Mask pattern – these can be quickly downloaded from online sources *pinterest* or you can create your own shapes. The best part of this craft is that it is a very basic craft that can be made more elaborate to fit your crafter’s skill level. Start with the foam sheet in your choice of colors, then choose your pattern or make one of your own. As suggested, patterns can be down loaded online from Google images, Pinterest (we did the search for you) or you can get creative on your own. Pro Tip: print out patterns then trace them on to cardboard for repeated use and a more stable surface. Trace your pattern on to your foam pad and cut it out. Another Pro Tip: cut out eye holes using non-patterned scissors, fold eye holes in half and cut a semi-circle. You can trim or widen the eye holes after your initial cut is made. We usually do any coloring or drawing on the actual template first. Next comes the gluing on of any jewels, buttons or feathers. Pro Tip: when gluing on feathers blow on the feather to establish the ‘back’ of the feather then put your glue on the mask, never on the feather. We suggest adhering the feather to the back side of your mask. Using glue directly on feathers will tear the feather, making it unusable. Next step is GLITTER. (Obviously we’re excited). The best technique for glitter is to use bottled crafting glue, drawing on your mask in whatever pattern you would like your glitter to be. Pro Tip: pretend that the glue is a marker to create the design. We suggest placing your semi-decorate mask on a paper plate and sprinkle your glitter on top of the glue – or you’ve heard the stories…glitter infecting the lives of children and homes for years to come. 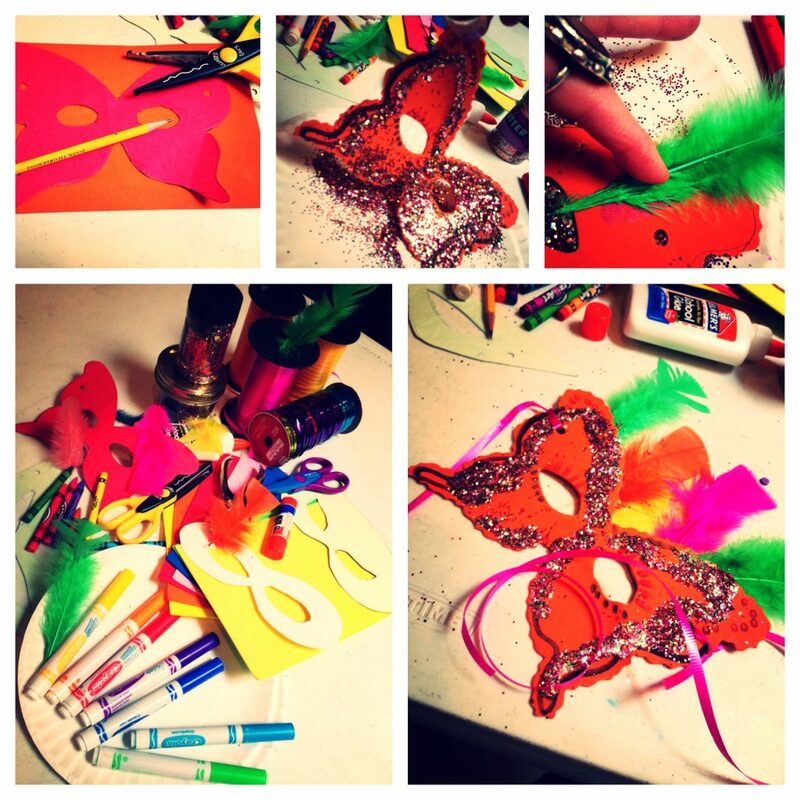 Let the glitter sit for about 30 seconds then gently lift your mask over the paper plate and shake off excess glitter. Using the paper plate means you get to reuse the excess glitter…and obviously we feel very strongly about not wasting this precious material. Here’s to New Year’s Eve crafts, a wonderful wish for 2017 and the chance to have everyone jelly of your get-up on Saturday night.